Where did my Name and Logo Originate? As I waited to find the exact name that resonated with what I wanted to do in my practice, and that spoke of my journey to this time....a name finally came to me in my sleep, that I didn't know the meaning of, and when I discovered the meaning....it was PERFECT! My Logo is the result of a series of meditations on the subject over the period of several weeks. It contains the Flower of Life, The Tree of Life, The Healing Lotus, and My Hands. The Lotus Flower is a Symbol for Healing, Life, Transformation, Spirituality and Enlightenment. Lotus flowers are also commonly used by those who have undergone hard times and are now recovering. Just like the lotus, they were in the muddy, dirty and yucky foot of the pond, but have now risen to the surface to show a beautiful object of a life full of beauty. The Flower of Life is the modern name given to a geometrical figure composed of multiple evenly-spaced, overlapping circles, that are arranged so that they form a flower-like pattern. It is considered to be a symbol of sacred geometry, said to contain ancient healing and religious value depicting the fundamental forms of space and time. There are many spiritual beliefs associated with the Flower of Life. 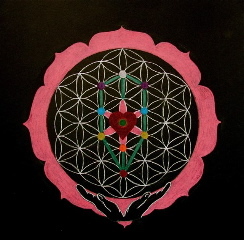 The Flower of Life is one of the strongest sacred geometric shapes in the world and is excellent for healing and helps one to connect to the Higher Self.The concept of a Tree of life as a many-branched tree illustrating the idea that all life on earth is related has been used in science, religion, philosophy, mythology, and other areas.